Ever notice how a beautiful new countertop can make even an old kitchen look great again? That’s why, at One Week Kitchens® in Forty Fort and Quakertown, we carry a wide range of different countertop materials that are sure to match your budget and your taste. 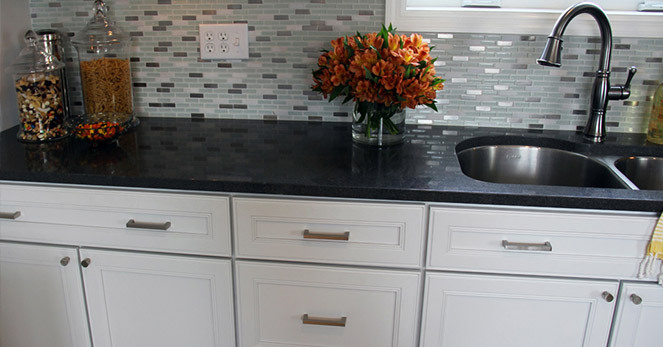 From granite to quartz, from tile to Corian we carry them all. Let our in-house design experts show you all the different countertop materials you can choose from and show you the pros and cons of each. That way you can make an informed decision on what will work best for you. To find out more about our kitchen-remodeling process, countertop replacement, and the products we carry, just click below.We provide beautiful new countertops for many areas of Pennsylvania, including Allentown, Bethlehem, Kingston, Clarks Summit, Bloomsburg, Lehighton, Mountain Top, Danville, Stroudsburg, Dunmore, Dallas, Berwick, and more. We Carry A Variety Of Products to Match Your Needs – And Your Budget. Some Materials Simply Work Better Than Others – Find Out What Works Best For You. Choosing A Countertop Doesn’t Have To Be Complicated – But It’s Only Logical That You May Have Some Questions. Seeing Is Believeing – See our work, notice our quality, find your inspiration.